As the dust is settling after this year’s monumental series of wins for liberals, I’ve been reflecting on my past election night experiences. My first presidential election memory is from 1992, when my parents took me to see Bill Clinton speak shortly before he became president. I remember that it was right before the election, because I spent most of the time on the shoulders of a friend of my parents, eating Halloween candy. I don’t have many other memories of that night, but it was my first introduction to the excitement leading up to election night. Although I was only 17 at the time, I had an internship with KUOW, Seattle’s NPR station, during the 2004 election. We interns spent the weeks leading up to the elections interviewing people on the street, and I spent election night interviewing party-goers at my parents’ party. The day after I went into the KUOW studios at about 6:30 in the morning. I made it to the newsroom just in time to hear that Bush had won another term. Four years ago I could vote, and was ecstatic to vote for Obama. That night started out at the Sheraton in Downtown Seattle, the Democratic headquarters for election night, where some friends who had helped campaign for local causes got us into some of the private parties in double-digit floor suites. 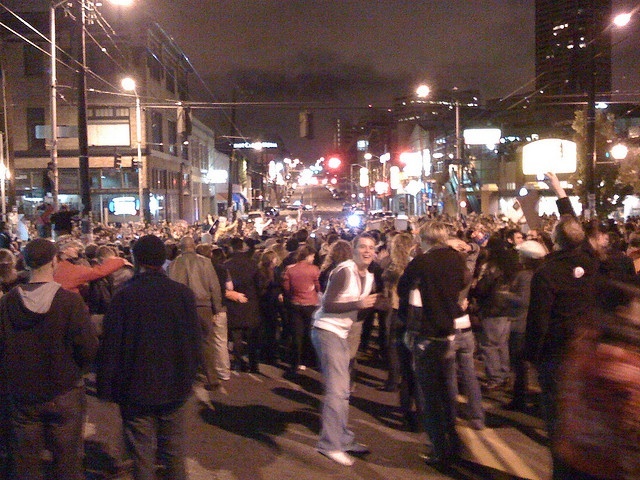 As more and more positive election results came in, we moved, as if swept by a current of political change, from Downtown to Capitol Hill, where the streets were blocked off and cross-dressers were singing God Bless America from the roof of Neighbours, one of Seattle’s best-known gay bars. This year was decidedly different. There were no election night parties to go to – in fact, there was little sign in our town that an election was even happening. Karyn and I were in the car, listening to NPR streaming through my phone, when we heard that it was official: Obama would be our president for another four years. We burst into laughter and tears and shouts of joy, and drove around the parking lot of our local grocery store yelling the good news. When we got home I called my family, who were just as excited as I was. True, it was no Capitol Hill, no thousands of people. But looking up at the Milky Way and thousands of stars, breathing in the cool ocean breeze, I was just as happy. After all, I am still in America. The breadth of my election night experiences go to show what an amazing and beautiful country it is that we live in, and I can’t wait to see where President Obama will take it over the next four years.